When it comes to guitar tone, it’s not just about the amp – the speakers also have a profound effect on how that tone comes out. Manufacturers are certainly aware that the choices they make must compliment their amps. This month, I spoke with Scot Sier, Budda Amplification’s Founder and President, about amplifier design and speaker selection. What’s the process for creating a new amp? Do you attempt to fill a niche or try to emulate something similar on the market? Neither really! Our design process comes from listening to what Budda artists, producers, engineers, guitar techs and players are looking for in a tube amp. We’re fortunate to have created a unique sound that musicians want to share. Do you aspire to create a specific tone when designing a Budda amp? Yes, for both the clean and overdrive modes. Our tone doesn’t imitate older vintage or current amplifier designs. Our dualclass, hot-bias circuit offers a sound that is harmonically complex and gain sensitive to pick attack. The clarity of the instrument’s tone is important to us. The Budda Rhythm Channel creates clean tones that serve as a platform to express the choices guitarists have made for their instrument’s wood, electronics, fret wire, hardware and neck attachment. You want to hear those nuances conveyed as accurately and musically as possible through your amplifier. Our amps have been used as a reference for many guitar, effects and digital modeling manufacturers in designing their products. Our Drive Channel also maintains the Budda “house sound” of full-bodied, harmonically rich tones. Infinite sustain, note clarity and timbre are expressed as you crank the amp in overdrive mode. Used creatively, the amp itself is as much an instrument as the guitar. What role overall does the speaker play in the Budda tone? The speaker is vital to the inherent quality of the sound. I use the analogy that speakers are like tires on a high performance car. Without a high quality design that can handle the power of the drivetrain, you may end up off the track and out of the race. Do you design the amp around the speaker or design the amp and find a speaker that compliments it? We first design the amp and then we design the speaker, ensuring that our signature clean and overdrive tones will be accurately and consistently represented. How do you go about finding the right speaker? What factors do you consider? First and foremost, it must handle the output of our circuit. A great speaker should focus on the midrange frequencies that are produced from a stringed instrument’s A 440 tuning. The complexity of your instrument and the amplifier’s tone (the volume, harmonics, etc.) should be faithfully reproduced so what the audience hears is the same as what the guitarist hears on stage. Do you prefer custom designed or off the- shelf speakers and why? We prefer custom speakers that bring out the best tonal qualities of our amp’s circuit and cabinetry. We originally loaded our amps with Celestion Vintage 30s, but with the help of feedback from Budda players, we designed our reliable, reference-quality Phat 12 speaker with Eminence. It nails all the right frequencies and gives our artists a fuller range of creative expression. How do you decide the power of the amp and what role does the speaker’s power handling capability play? Our range of power ratings serves the needs of players from small, intimate club settings to full stack stadium venues. At every power level, we preserve the reference, musicality and complex overdriven tones. The speaker not only has to handle the power of the Budda circuit – it must also maintain the clarity of the note at all gain settings. The Phat 12 accomplishes this and helps maintain the personality of each of our power tube configurations. Which features of the amp are you most pleased with? What’s cool and/or different about your amp? The way they sound, especially the powerful and immediate response to pick attack at all gain settings. Our amps are designed for ease of use, functionality and purity of signal path. The amps and speakers punch way above their weight class in terms of wattage, and the use of real pine cabinets keeps them light and easy to gig with. 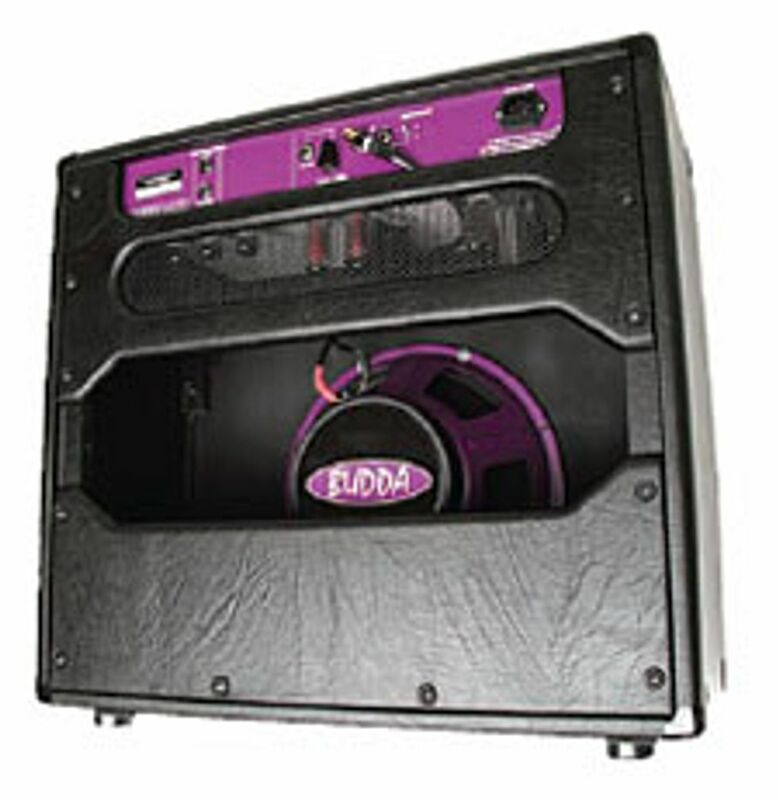 For more information on Budda Amplification and their products, please visit Budda.com.